On a recent post, I talked about how I discovered caterpillars consuming the flowers to my Sourwood tree. I was determined to find out what they were so I collected one and put it in a jar on my desk. A few days passed and the caterpillar formed a chrysalis, the smallest chrysalis I've ever seen! And roughly ten days later, it has emerged, no surrogate ant colony needed. 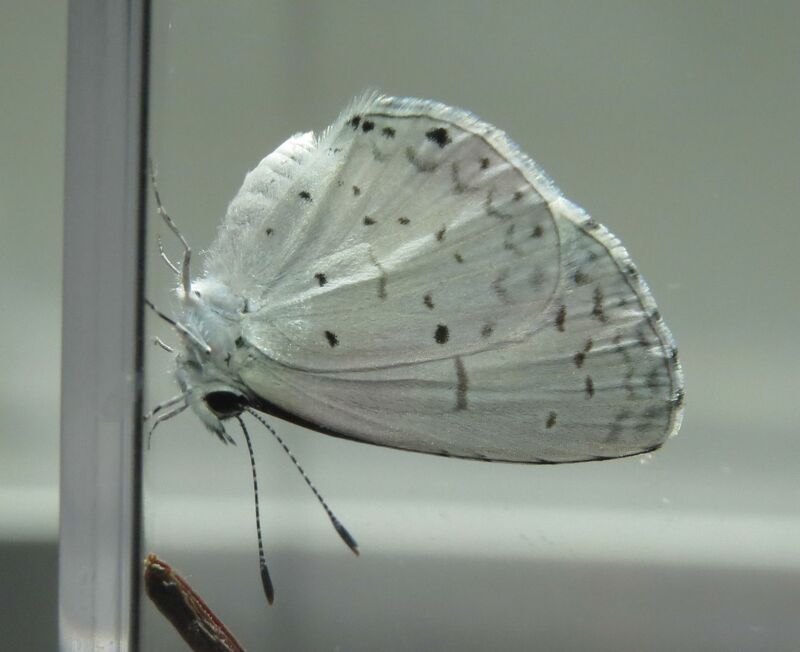 Spring Azure it is! Something in the Celastrina ladon complex. Basically there's like 4 or 5 butterflies that all look seemingly identical to one another and have a huge variety of host plants. What makes them a complex is that it's unclear how many species are involved, which ones use what host plants, and how each host plant alters the appearance of the caterpillar and the adult form. 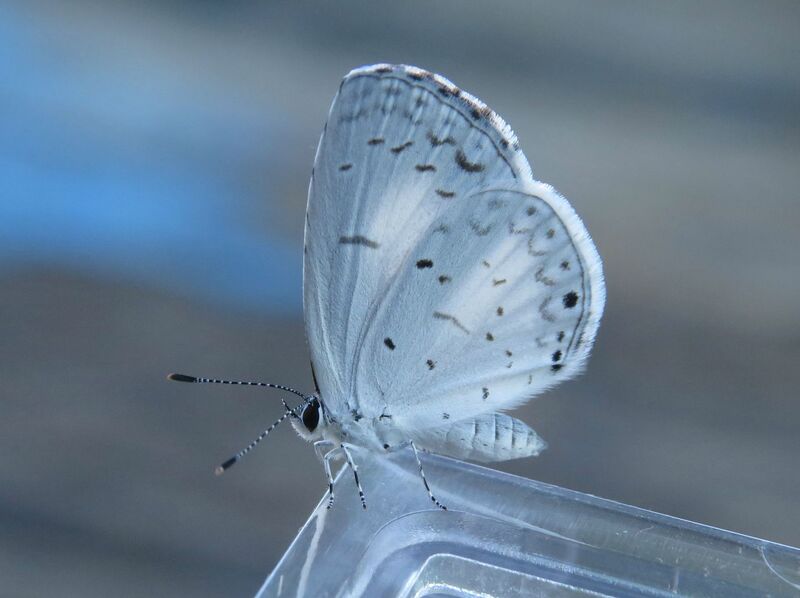 Overall this butterfly uses the flower buds Dogwoods, New Jersey Tea, and a few others but some host plants such as the Sourwood are unknown, which might suggest there are more species out there than the initial 4 or 5 believed to be in existence. My little patch of Nodding Onions has started to get more attention than hummingbirds. With more than 45 plants in bloom, my honeybees have started to take an interest. This is good because their focus has otherwise been completely devoted to the patch of mountain mint in an adjacent garden bed. Mints, while rich nectar sources, I've found can sometimes add their flavor of the honey which some folks don't like. They're also starting to work the Anise Hyssop, Joe Pye Weed as well the Buttonbush and Clethra alnifolia now that they're all in full bloom. Nodding onions were a surprise though. I had assumed they'd be treated like purple cone flowers, one or two bees per 50 blooms, but these are getting slightly more attention than that. Another thing is that I've realized I probably ordered about 32 plants two years ago, and now I have almost 50 flowering... so they've clearly reproduced. There's the main clump I have in a sandy patch which is how they grow them at the Mt. Cuba Center. Bulbs (onions) benefit from drainage in the soil, so when I read that they will also grow in clay, I'm skeptical. Yes they might grow and flower in clay but I suspect they won't reproduce as well or last as many years as they would in sandy spots. Granted the ones I have planted in clay are doing perfectly fine. In fact, at the risk of calling myself a hypocrite, the main patch I first planted in the sand seemed like it went through shock. The plants were lanky, wilted, seemed to demand more water. But that was the first year, now that they've got their roots established they seem to be growing equal to if not better than the ones I started in clay. Along with the main patch, I have a few plants scattered in other gardens and along pathways but nowhere near as densely planted. While walking the garden I noticed the honeybees had found these plants too which is a little odd. Generally when a bee does a waggle dance in the hive to give the coordinates about this awesome source of food they found, they normally wouldn't be finding these random plants away from the main patch. It's as though they're finding the main patch of onions and then exploring a bit to find plants that aren't getting as much attention. Normally when I see bees foraging in, say a field, you find them on the plants where the flowering is the most dense, rarely in the smaller patches forming the outskirts, if you understand what I mean. I'm taken by the lack of info there is on this plant as a nectar and pollen source for honeybees. It's generally agreed upon that bees like the plant, as well as everything in the Allium family (Garlic, Chives, other Onions) and if hummingbirds are using it as a nectar source you can be sure it's of high quality. In the book "Honey Plants of North America" they generalize onions into a simple paragraph, almost treating them like a cliff note. Granted the book was published in 1926 but it's still a publication well worth owning (though their taxonomy is almost 100 years out of date). In it they write, "Valuable for honey when grown for seed... ...The honey is amber-colored, and the peculiar onion odor and flavor almost disappear as it ripens. The flowers are white." But this refers to Allium cepa the common white onion grown the world over, not our native Allium cernuum and they pretty much skip over every other species though I think it's safe to say bees like all members of this family.